For those of you who want to enjoy the experience the traditional way, you can find some of the best outdoor sauna kits online and make it a reality. There are a number of different brands and manufacturers to choose from...but which one should you choose? Our experts have researched extensively to select four of the best options out there. Take a look below and decide which one is right for you. Which Outdoor Sauna Should You Choose? When it comes to the best outdoor sauna kits, it all comes down to the quality of the wood, the heater and the materials used to hold everything together. All of the companies above provide high quality outdoor saunas, so it's a matter of choosing the one that most appeals to you. Saunacore and Almost Heaven are on the higher end, and the quality is definitely superior to most other brands on the market today. If your budget is a little lower, take a look at Cedarbrook and Sauna Fin...both have very good outdoor saunas for you to choose from. 1. Think about the size that you are looking for. 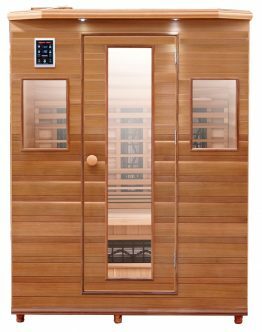 Do you need a 1-2 person sauna or a larger 4-6 person one? Although it may be obvious, the larger saunas will cost more than the smaller ones. 2. Think about the shape. You might have the traditional box in mind, but there are barrel-shaped options as well as full cabins with porches. Figure out which would work best for you. 3. Think about the wood. All of the best outdoor saunas will have thick wood walls, but most give you an option. Decide which wood fits in best in your outdoor environment. 4. Think about the heater. Do you want an electric heater, gas heater or a more traditional wood one one for your sauna? Think about the pros and cons of each. 5. Don't forget the extras. Some companies offer a choice of bench configurations, door options, windows, lights and design options. You can even customize it to fit your needs, especially with companies like Saunacore. Want us to help you choose the best outdoor sauna? Just use the form to the right and tell us what your needs are. We'll be happy to help you choose the ideal one for your indoor or outdoor environment. Let our experts help you choose the perfect sauna!